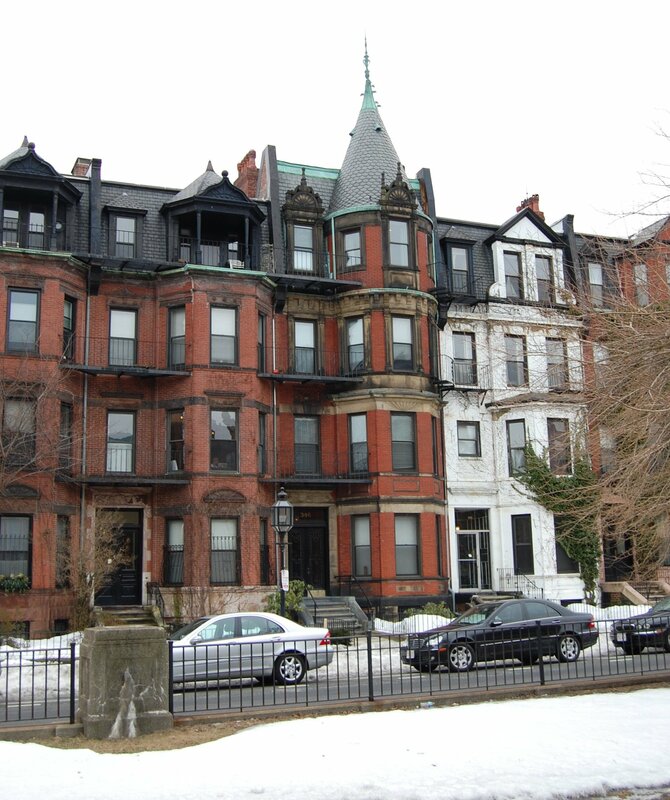 348 Commonwealth is located on the south side of Commonwealth, between Hereford and Massachusetts Avenue, with 346 Commonwealth to the east and 350 Commonwealth to the west. 348 Commonwealth was designed by Obed F. Smith, architect, and built in 1883-1884 by Vinal & Dodge, masons, for building contractor George Wheatland, Jr. for speculative sale. He is shown as the owner on the original building permit application, dated November 10, 1883. The house was originally numbered 346 Commonwealth until about 1889, when 328 Commonwealth was built and the houses to the west of it were renumbered. 348 Commonwealth was one of thirteen houses (336-360 Commonwealth) built for George Wheatland, Jr., by Warren D. Vinal and Charles A. Dodge on land owned by Charles Merriam and by Jacob Rogers. 336 Commonwealth was designed by George Avery, 338-340 Commonwealth were designed by Bradlee, Winslow, and Wetherell, and 342-360 Commonwealth were designed by Obed F. Smith. 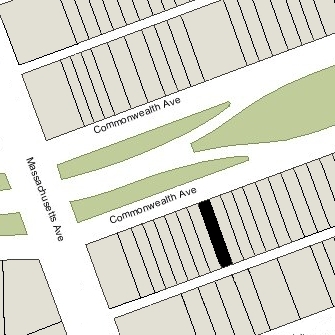 Click here for an index to the deeds for 348 Commonwealth, and click here for further information on the land on the south side of Commonwealth between Hereford and Massachusetts Avenue. On March 1, 1884, Jacob Rogers sold George Wheatland, Jr., the land where 348-350 Commonwealth were built. On December 7, 1885, 348 Commonwealth was purchased from George Wheatland, Jr., by Francis Asbury Sawyer and his wife, Emma King (Smith) Sawyer. They had married in September of 1884 after which they had lived at the Hotel Copley at 18 Huntington. Francis Sawyer was a shoe machinery manufacturer, serving as treasurer of the Rubber Step Manufacturing Company. Francis Sawyer died in December of 1889 and Emma Sawyer moved soon thereafter. On May 28, 1890, 348 Commonwealth was purchased from Emma Sawyer by Sarah Elizabeth (Silsbee) Woodbury, the wife of John Page Woodbury. They previously had lived at the Hotel Huntington (Huntington at Blagden). John Page Woodbury was retired from the real estate and insurance businesses. He was a noted collector of books and prints. Living with the Woodburys were their daughter, Mrs. Marcia Eola (Woodbury) Parsons, the former wife of Edward P. Parsons, and their two sons, Ernst Mey Parsons, who became an architect, and Harold Woodbury Parsons, who became a noted art expert. John Woodbury, Marcia Parsons, and her sons continued to live at 348 Commonwealth. Marcia Woodbury traveled to Europe and Ernst Parsons moved to Brookline. 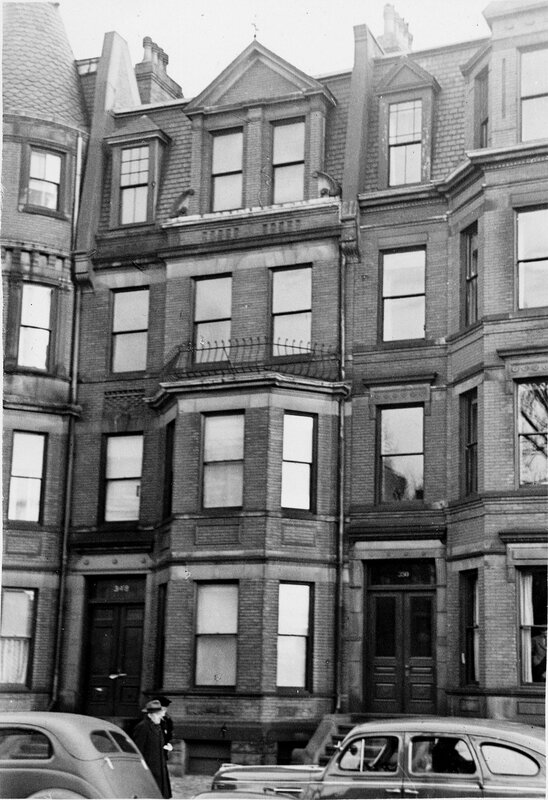 Harold Parsons, still a student, may also have moved to Brookline; by 1914 he was living at 345 Marlborough with his uncle, John Woodbury, and his wife, Jennie Russell (Churchill) Woodbury. On February 1, 1911, 348 Commonwealth was purchased from Marcia Parsons by retired coffee and tea merchant Henry Pickering Smith. He and his wife, Caroline C. (Pritchard) Smith, made it their home. They previously had lived in Brighton. They also maintained a home in Rangeley, Maine. Their daughter, Rachel Derby Smith, lived with them until her marriage in January of 1930 to Count Friedrich Franz Grote, a landowner in Mecklenburg and later a Nazi SS officer. Henry Smith died in October of 1931. In his will, he left 348 Commonwealth in trust for the benefit of his wife during her lifetime, and then to be conveyed to his daughter, Rachel. Caroline Smith continued to live at 348 Commonwealth. In February of 1932, she applied for permission to convert the property from a single-family dwelling into two apartments. She subsequently abandoned the permit, but it appears likely that she nevertheless converted the property in the manner she had proposed, and the second apartment became the home of her son-in-law and daughter when they were in the United States. Friedrich Franz Grote died in March of 1942 in Pekachino, Russia. By 1946, Rachel Grote had returned to the United States and was living at 348 Commonwealth. Caroline Smith died in April of 1946 and on July 23, 1946, the trust established under Henry Smith’s will conveyed 348 Commonwealth to Rachel Grote. Rachel Grote married again in October of 1946 to Carlos Julius Warner, a US foreign service officer. On March 6, 1947, 348 Commonwealth was purchased from Rachel Warner by Benjamin Dunham Gilbert, a salesman, and his wife, Ethel Stella (Campbell) Gilbert. They previously had lived at 154 Bay State Road. In August of 1948, he applied for (and subsequently received) permission to convert the property from a single-family dwelling into three apartments. The Gilberts continued to live there until about 1952. By that time, he was operating a collection agency at 348 Commonwealth. By 1953, they had moved to 275 Marlborough. On June 23, 1952, 348 Commonwealth was purchased from the Gilberts by Nahum Benjamin Kovar and his wife, Bessie (Snyder) Kovar. They lived in Albany, New York, and may have purchased the house either for their son, Dr. Leo Kovar, who was a physician at the Veterans Hospital in Boston, or their daughter, Rhea (Kovar) Sossen, a chemist, who had married in 1951 in Boston to Harold Samuel Sossen. On October 1, 1952, 348 Commonwealth was purchased from the Kovars by Agnes H. Purdy. The property was shown as vacant in the 1953 City Directory. On March 26, 1953, 348 Commonwealth was purchased from Agnes Purdy by Charles Thomas Mills, Jr., and his wife, Mary Mills. They lived in one of the apartments. They previously had lived at 24 Queensberry. In September of 1953, they applied for (and subsequently received) permission to convert the property into three apartments and a dental office. Charles and Mary Mills lived in one of the apartments until about 1962. Dr. Arthur Irving Cohen, a dentist, maintained his office there for the same period, after which he moved it to 306 Commonwealth. He and his wife, Florence (Goldberg) Cohen, lived in Hull and then in Newton. On November 1, 1962, 348 Commonwealth was acquired by Russell Amaral, trustee of the Sudan Realty Trust. In April of 1964, he applied for (and subsequently received) permission to convert the property from three apartments and a dental office into seven apartments. On April 15, 1965, 348 Commonwealth was acquired from Russell Amaral by Barnett Feldstein and his wife, Edith (Martin) Feldstein, as trustees of the Tudor Realty Trust. On April 1, 1967, 348 Commonwealth was acquired from the Feldsteins by Robert White. He already owned 324–326 Commonwealth, and subsequently acquired thirteen more houses on the block. By December of 1978, he owned 322–324–326–328–330–332–334–336 Commonwealth, 344-346-348–350 Commonwealth, and 354–356–358–360 Commonwealth. 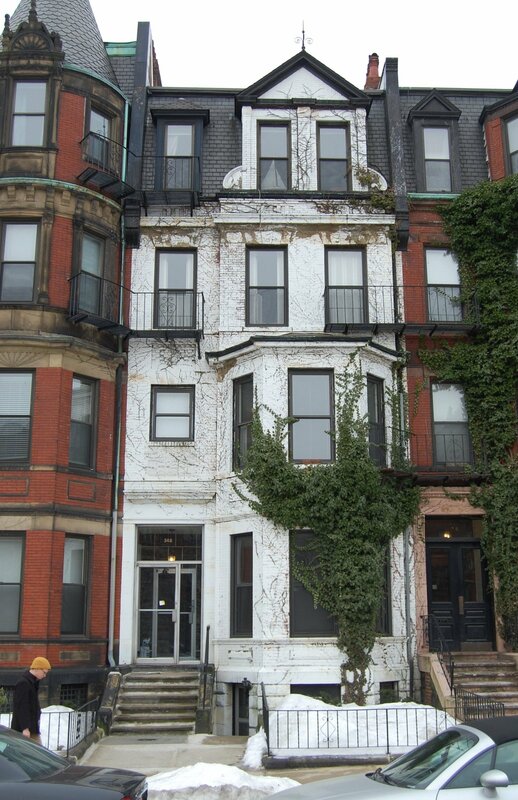 In December of 1988, he applied for (and subsequently received) permission to convert 348 Commonwealth from seven apartments into eight apartments. At the same time, he also applied for (and subsequently received) permission to combine it with 344. 346, and 350 Commonwealth into one property, to be known as 344-350 Commonwealth. On May 5, 1989, he filed for (and subsequently received) permission to increase the occupancy of the four buildings from 17 to 35 apartments. 344-350 Commonwealth remained an apartment building in 2018.